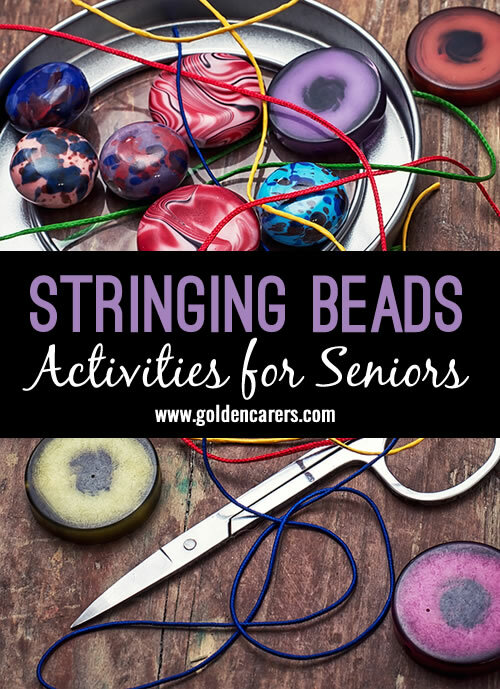 Every Monday morning we have a volunteer to comes and she shows how to make Jewellery we let them choose colours, shapes, beads and make bracelets, necklaces and the residents do have a great time!. Making stretch bangles using hat elastic works well also, although it can sometimes be difficult to thread the beads unless they have large holes. Our residents love them for holding their hankies. If made well these last a long time. If anyone has an easy way for threading the elastic please let me know as I usually do the threading but have the resident hand me the beads. I will try your necklaces next. Thanks for the great ideas. thank you for your samples...do you have a sample of residents daily participation sheets with sample codes?